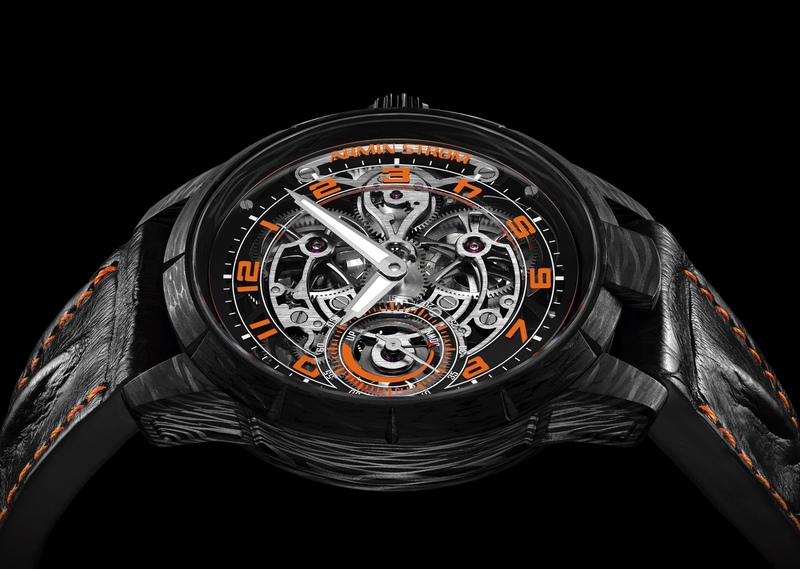 Armin Strom has given its groundbreaking Masterpiece 1 Dual Time Resonance watch a new sapphire case (pictured above). The Dual Time Resonance Sapphire offers an even better view inside the unprecedented mechanical movement which combines two time zones and a true resonance system – including two balance systems connected by the company’s patented resonance clutch spring – in one watch. Retail is $280K. Audemars Piguet updated their standard (not Jumbo) 41 mm Royal Oak this year with the new Ref. 15500, replacing the 15400. The Royal Oak 15500 has an all-new automatic movement, caliber 4302, and comes in your choice of black, blue, or gray dial. The company redesigned the dial, including resizing and repositioning the logo, as well as enlarging and shortening the applied hour markers. 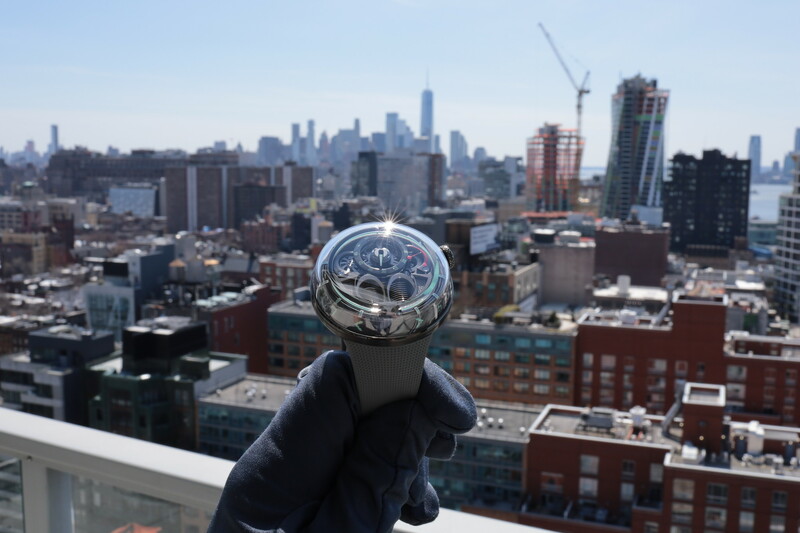 Overall, the company’s standard Royal Oak, available in steel or rose gold, looks pretty sharp. Retail is $17,800. Jaeger-LeCoultre introduced one of their ultra-complicated Hybris Mechanica timepieces this year at SIHH, something they do very rarely. The new Master Grande Tradition Gyrotourbillon Westminster Perpetuel is the first multi-axis tourbillon with a constant-force mechanism, Westminster chime (same melody as Big Ben), and perpetual calendar. All of this was fit in a 43 mm x 14.08 case, which is quite impressive. The finishes are also very impressive, as you would expect at the $910K price point. 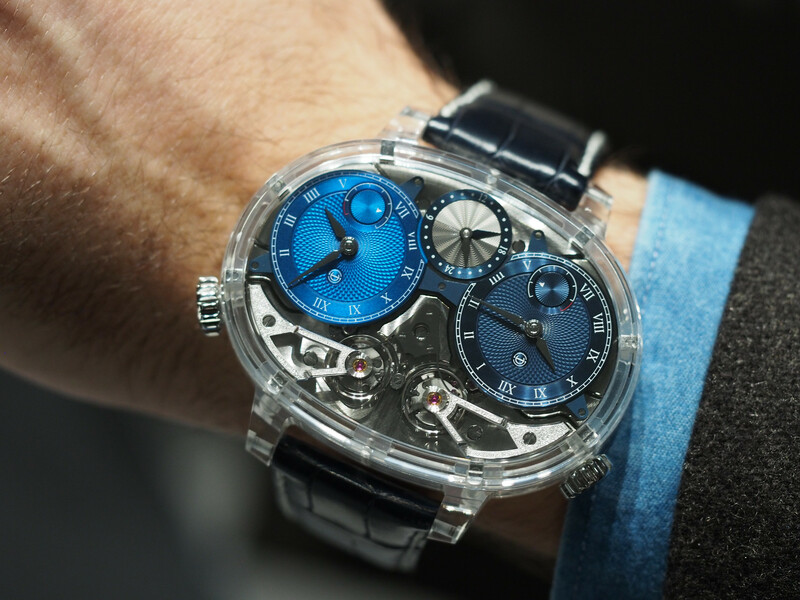 This is the Romain Gauthier Logical One, a piece unique featuring an oven-fired, satin-finished blue enamel hour and minute dial and small seconds subdial. The case measures 43 mm in diameter and is made from 18K white gold. An in-house constant force chain movement, with the company’s signature push-button winding (46-hours), drives the hours, minutes, and small seconds. The mainplate and some of the bridges have been treated with 4.5N rose gold. A Byzantine-inspired geometric pattern is engraved on the gold mainplate and bridges, which took 100 hours to do by hand. Another 90 hours was spent finishing the rest of the movement. Retail is approximately $185,000. This year Lange introduced a new version of the Datograph Perpetual Tourbillon, which previously was available in a 100 piece platinum version with black dial in 2016. This 100 piece edition comes in an 18K white gold case with a pink gold dial. As with the previous iteration, the case measures 41.5 mm in diameter and features the flyback chronograph, perpetual calendar with moonphases, a tourbillon with stop seconds, and a power reserve indicator. 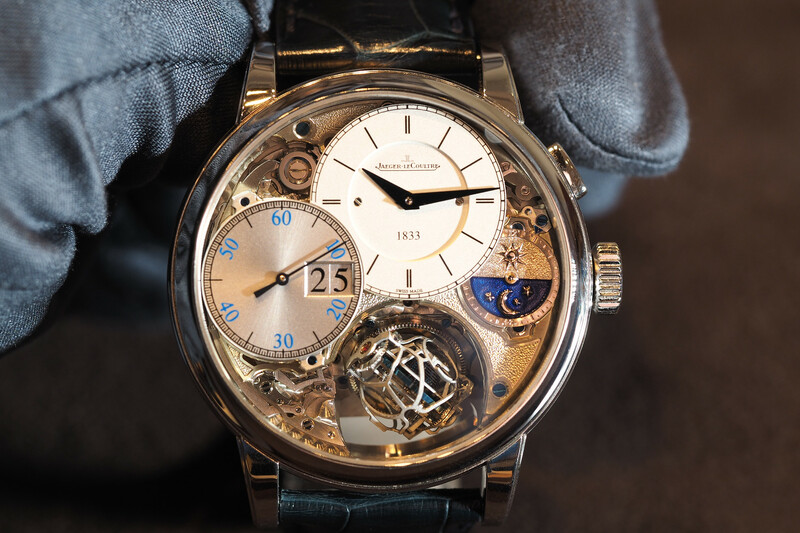 The standard Datograph movement is stunning, and this steps it up another notch with the signature German silver mainplate and bridges, incredibly finishing on every single one of the 729 components, and a diamond chaton to top it all off (which Lange includes only on its tourbillon movements). Retail is $287K. Photos by Robert Velasquez (@spanishrob) of London Jewelers. See more on Instagram @TheLondonWatch.